Call for Papers for a panel at the Modern Language Association (MLA) Annual Convention, 9-12 Jan. 2014, in Chicago. Sponsored by the MLA Division on Nineteenth-Century American Literature. The MLA Discussion Group on Comics and Graphic Narratives is pleased to announce this panel for MLA 2014 organized by its sister entity, the Division on the Nineteenth-Century American Literature. The explosion of print media in the 19th century has become a critical commonplace; the impact of photographic images on the period been studied extensively. 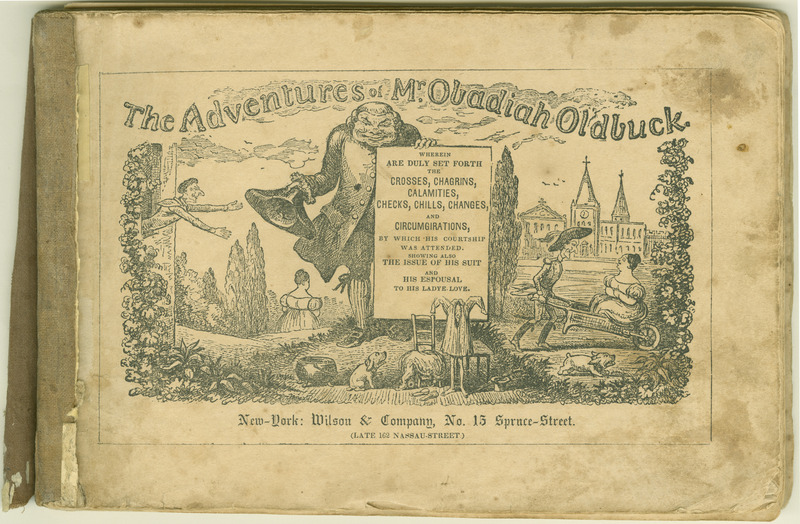 We invite submissions that take up the combination of word and image, as in The Adventures of Mr. Obadiah Oldbuck (1842), the first graphic novel published in the United States, and graphic work popularized in periodicals from Harper’s Weekly to Frank Leslie’s Illustrated Newspaper. Abstracts by Mar. 15 to Augusta Rohrbach (augustrohrbach [at] gmail [dot] com) and Hillary Chute (chute [at] uchicago [dot] edu). Updated, 26 Dec. 2012: Besides the three panels and the cash bar (!) sponsored by our Discussion Group (i.e. the Comics and Graphic Narratives Group), MLA 2013 in Boston will host several other sessions dedicated or strongly related to comics studies, as well as many individual papers that, as far as we can tell from the program, relate to the field. Though the number of comics-themed events this time around does not quite match the all-time high set by last year, interest in comics at the MLA obviously remains strong—a hopeful sign for the future! Sadly, the MLA’s searchable online program does not include the search term comics or graphic narratives in its drop-down menus, and, though it is possible to type those words (or any words) into the search field, not every panel or paper related to comics studies is necessarily labeled as such. So, skimming through the entire program remains the surest way to find all the comics-themed events at the convention. We’ve done that—and, in hopes of spreading the word about comics scholarship at MLA, we offer the following two lists. The first list, Other Comics Studies Panels, consists of entire sessions either clearly devoted to or declaring a substantial interest in graphic narrative. By substantial interest we mean that the session either includes more than one paper definitely focused on comics and/or spotlights “comics” or “graphic narrative” in its title. Some of these panels are special (i.e. ad hoc and independent) sessions, while others are sponsored by standing MLA Divisions or allied organizations. The second list, Individual Papers on Comics, consists of single papers that appear to focus on comics, cartooning, or visual narrative but within sessions organized around other topics. These we’ve listed by session and paper title, without listing all the other paper topics involved in these sessions. We hope we haven’t missed any comics studies sessions or papers. If you think we have (or if we’ve misrepresented your work), please drop us a comment here so that we can correct our mistake. Thanks! We hope these lists prove helpful as you plan out your MLA experience. “Remediated Photographs and Reconstructed Memories: Personal and Familial Pasts in Fun Home: A Family Tragicomic,” Genie Giaimo, Northeastern Univ. “Unbecoming Cuban American: Representations of Female Subjectivity in Bad Habits: A Love Story, by Cristy Road,” Irune del Rio Gabiola, Butler Univ. “Trans-nepantlista Visual Geographies and the Inked Latina Body: Ana Mendieta’s Graphic Life Writing,” Emma Ruth García, Colby Coll. ; Magdalena M. Maiz-Peña, Davidson Coll. “The Citational Uses and Abuses of Understanding Comics and the Scholarly Futures They Forecast,” Michael Chaney, Dartmouth Coll. Presiding: Courtney Baker, Connecticut Coll. “The Queer Contest between Modern and Postmodern Modes of Vision in Alison Bechdel’s Fun Home,” Robin Bernstein, Harvard Univ. “‘I Saw It’: The Photographic Witness of Keiji Nakazawa’s Barefoot Gen,” Laura Wexler, Yale Univ. Presiding: Nicholas Sammond, Univ. of Toronto; Paul D. Young, Vanderbilt Univ. “Playful Aesthetics,” Mary Flanagan, Dartmouth Coll. “Acoustemologies of the Closet: The Wizard, the Troll, and the Fortress,” William Cheng, Harvard Univ. 3. “Bandes dessinées téléchargeables: Un nouveau moyen de mesurer la diffusion de la langue française au 21ème siècle,” Henri-Simon Blanc-Hoang, Defense Lang. Inst. 2. “Intersections of Word and Image: The Lebanese Civil War in Graphic Form,” Carol N. Fadda-Conrey, Syracuse Univ. Presenter Sarah Henzi, in her comment posted here on Dec. 21st, notes, “I will be discussing the Graphic Novel in the context of Aboriginal/Native Literature.” Thank you, Sarah! 3. “Drawing Disability in Japanese Manga: Visual Politics, Cultural Attitudes, and Wheelchair Basketball in Inoue Takahiko’s Real,” Andrea Wood, Winona State Univ. new aspects of the Kafka factor in five award-winning graphic works that engage with Kafka’s works and transcend disciplinary boundaries. Two of them are films. They explore themes such as Kafka’s criticism of family and society, alienation, persecution, and the grotesque struggle with bureaucracy. Shaun Tan’s “The Arrival” (2006) features frightening and wondrous visuals without text. A. Bechdel’s “Fun Home. A Family Tragicomic” (2006) revolves around a dysfunctional family; G. L. Yang’s “American Born Chinese” (2006) thematizes fitting in and dual identity; M. Satrapi’s “Persepolis” (film 2007) illustrates an exiled Iranian girl’s experiences in Vienna and Paris; A. Folman’s “Waltz with Bashir” (film 2008 and book 2009), explores personal experiences of the Holocaust generation and the filmmaker’s involvement in the Palestinian conflict. 1. “Late Victorian Publicity: Oscar Wilde from The Artist to Punch,” Loretta A. Clayton, Macon State Coll. 3. “Empathy and Shared Feeling in Visual Narratives,” Jo Kremer, Yale Univ. In addition to the three sessions sponsored by our Discussion Group (i.e. the Comics and Graphic Narratives Group), MLA 2012 will be hosting many other events relevant to comics studies. In fact, the program shows that the MLA’s interest in comics and graphic narratives is at an all-time high. The amount of work being done on comics within the MLA now is startling to those who remember leaner, hungrier times—it’s a veritable groundswell! Unfortunately, it’s not possible to search for the subjects comics or graphic narratives in the MLA’s searchable online program. So, to spread the word about this groundswell, we of the Comics and Graphic Narratives Group offer the following list of comics studies events at MLA 2012 other than our own. “Criminal Melodrama and Hypertrophic Gesture in ¡Alarma! and ¡Casos de Alarma!,” Sergio Delgado, Harvard U. “Sequential Berlin: Jason Lutes’s City of Stones Series,” Ksenia Sidorenko, Yale U. “Retelling History in the Borderlands: Jaroslav Rudiš’s Alois Nebel and Bomber by Jaromír 99,” Martha B. Kuhlman, Bryant U.
Presiding: Joshua Paul Dale, Tokyo Gakugei U. “Subversive Cute: The Other Serious Anime and Manga,” Kerin Ogg, Wayne State U. “Current-Affairs Comics in a Global Context: The Comic Heart of Darkness,” Marie Thorsten, Doshisha U.
Gene Luen Yang, author of American Born Chinese, will be the featured speaker in this discussion of Asian American graphic narrative. Graphic novels and memoirs form an increasingly important part of the Asian American literary canon, offering new insights into issues of stereotyping, autobiography, and historical memory. GB Tran’s Vietnamerica, Adrian Tomine’s Shortcomings, and Lynda Barry’s One Hundred Demons will be among the works discussed. Presiding: Magdalena M. Maiz-Peña, Davidson Coll. “Alissa Torres’s Graphic Tale of Grief: American Widow; or, My Husband Bleeds History,” Janis Breckenridge, Whitman Coll. “The Anxiety of Density in Graphic Novels: Solutions Based on Genderic Conventions and Creative Collaborations,” Maria Elsy Cardona, Saint Louis U. “Helen Zouk’s ‘Desapariciones’: Shooting Death,” David William Foster, Arizona State U. For abstracts, visit www.aihaweb.org/italianamericanliterature.htm after 24 Dec. 2011. “‘Aint I de Maine Guy in Dis Parade?’: Sympathetic Immigrant Narratives and the Transnational Worker in Early American Comic Strips,” Michael T. R. Demson, Sam Houston State U.
Presiding: Rossen Djagalov, Yale U.
Respondent: Martha B. Kuhlman, Bryant Univ. This session explores the complexities of self-narration across media and formats with particular emphasis on those that blur genre lines. Autobiographical artists’ books, graphic novels are often highly self-reflexive, and their metacharacter as books about books, or subversions of norms, makes them sites of citation and parody in which formal mimicry and content play with readers’ expectations. NOTE: If you are presenting a comics-related paper or event at MLA 2012 and we have failed to list you here, please leave a comment on this blog so that we can correct the oversight. Likewise, everyone listed here, please help us keep this list accurate and up-to-date! Presiding: Astrid Boeger, Hamburg Univ. Unfortunately, this second panel, Graphic Novels and Cultural Memory, is scheduled opposite the panel Graphic Aging co-sponsored by our Group and the Discussion Group on Age Studies. Ouch! A regrettable conflict, outside of our Group’s control. 3. “What Is Worth Saving? The Salvage Work of Comics,” Theresa Tensuan, Haverford Coll. 2. “Revisiting the French Noir: The Birth of Adele Blanc-Sec,” Anouk Alquier, Smith Coll. 2. “Muslim Women in Naif Al-Mutawa’s Comic Book The 99,” Shirin E. Edwin, Sam Houston State Univ. 1. “The Holocaust in Iranian Media: The Hamshahri Cartoon Contest and Zero Degree Turn,” Justin Neuman, Yale Univ. This session will focus on the teaching of life writing, with particular emphasis on the issues raised by life writing today. Heidt will focus on teaching gender and life writing; Watson will address the teaching of memoir in the light of the questionable truth claims that have lately attached to it; Mintz will consider disability and life writing; Stone will focus on immigrant and ethnic life writing; and Ball will discuss the teaching of life writing in the form of the graphic novel. Truly, this is a windfall in comics studies research at MLA. We’re delighted to contribute to the general upsurge!